If the Mediterranean can be arguably construed as the cradle of civilization, then Italy certainly has a favorable geographical position in this debate, as it protrudes into the middle of the sea. 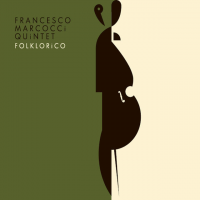 Francesco Marcocci learned the bass in his hometown of Pisa, Italy, and in the process absorbed the rich musical legacies prevalent in the region. His release FOLKORiCO, is an accumulation of influences as vast as the waters which surrounds his homeland and spreads to the ancient beyond. From the opening of “Shardana,” there is an instant connection with the primordial music which was spread from Turkey and Egypt into the Mediterranean basin by “the sea people,” Shardana, from which came the name of Sardinia. A special guest on this track is Dave Liebman, who makes a dramatic impression with his authentic flute and soprano interpretation of this ethnically distinctive music. “Galicia,” pays homage to the Celtic strains which swayed the music of northern Spain, but it is done with a strong jazz sensibility, courtesy of alto man Godwin Louis. They are off to Africa on “La grande madre,” with Louis shifting over to soprano sax and weaving a trail across the Serengeti, while Marcocci drives down an anchoring bass, allowing the master of tempo travel Willy Rodriguez to demonstrate a formidable sense of time and control. The pace is alleviated with “On a sentimental journey,” and as the name implies, it is a melodic ballad with Liebman featured again, this time on tenor. Pianist Leo Genovese hails from Argentina and composed “Pa Abalos y Messiaen,” which is centered on the hemiola syncopated chacarera rhythms of his birthplace. This music is the rural counterpart of the urban tango, yet they have an underlying harmonious connection which is pure Argentine. “Danny Richmond—Raw,” is a polyrhythmic tribute to the longtime Charles Mingus drummer and stalwart. With Rodriguez executing multifaceted tempo variations and Marcocci’s myriad bass intonations, this piece is a showcase of acid swing done right. Folklore, by definition, are beliefs or practices, verbal or musical, which originated amongst the common people and were passed on in the oral tradition. Francesco Marcocci knows this concept well and ingeniously adapted it to his jazz quintet. Spanning from the Mediterranean through Africa, Spain, South America, to the streets of New York, he conveyed the ancestral strains of FOLKLORiCO enveloped in a contemporary format to substantiate how this music has progressed. Track Listing: Shardana; Galicia; La grande madre; On a sentimental journey; Pa Abalos y Messiaen; Danny Richmond – Raw; Ribolita. Personnel: Francesco Marcocci: double bass, hand clapping (5); Godwin Louis: alto sax, sprano sax (3); Leo Genovese: piano, Rhodes, organ, bag pipe, mbira (3), tenor sax, Realistic – Moog, hand clapping (5); Willy Rodriguez: drums, jingles, vibraslap, claves (3); Damion Corideo: percussion; Dave Liebman: tenor sax, 7soprano sax, flute (1, 4, 7).